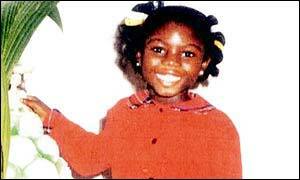 Victoria Climbie died through "extreme torture"
Today Maria Colwell would be 37. She died on 7 January 1973, when she was seven. Her bruised and battered body had been pushed down the hill from her Brighton home to the local hospital by her stepfather in a pram she herself used to carry coal. Her body was described as being painfully thin. She had been subject to a terrible beating. In life no-one had heard of her, in death she became a landmark in social care - the public inquiry which followed led to major changes in the systems designed to protect children from abuse. The aftermath of Maria's killing was sadly only the first of many attempts to tackle this issue and make the authorities more responsive and more effective. In the 30 years since, countless volumes have chronicled and pontificated on the lives and deaths of children. Children killed by adults expected to care for them and failed by agencies charged with protecting them. It would be wrong to say these inquiries have made no difference - as a result of their recommendations practices have been tightened up and agency co-operation improved. Sometimes the systems do work. And yet it has become increasingly clear over the past year that, as they failed a child 30 years ago, so too often they are failing children today. Victoria Climbie, like Maria Colwell, became famous because of the terrible way in which she died. Terrible in the sense that it is hard to imagine how anyone could subject a nine-year-old to extreme torture, hit her with a bicycle chain, tie her up naked in a bin bag and leave her frozen in her own excrement in a bathroom, without heat or light or food. Terrible too in the sense that 30 years on so many of the lessons from Maria's death had plainly not been learnt. Soon, perhaps in February, we will be able to peruse the latest effort to get our child protection system right. Lord Laming's inquiry report is eagerly awaited by Victoria's family, by those working in child protection and by government ministers. Everyone is anxious to learn the lessons. By the time the first phase of the inquiry ended in February, the full extent of the failings that led to Victoria's death had become all too apparent. At first it seemed more about individual culpability - the social worker Lisa Arthurworrey made astoundingly bad decisions as did the police officer Karen Jones - they were described as "supremely incompetent". Indeed the inquiry heard of 12 missed opportunities - 12 instances when professionals not only could but should have acted to save Victoria. Lisa Arthurworrey said she had been made a "scapegoat"
Each one represented a professional misjudgement of one kind or another - warning phone calls that went unheeded, decisions not to check the version of events given by Victoria's great aunt, missed visits, medical misdiagnoses and above all throughout many encounters, an almost total failure to engage with the little girl who should have been the centre of everyone's concern. Her views were never sought. And yet it was clear by the final submissions that this was more than a story of incompetence among front-line professionals. This was also about management failings - middle-ranking and senior staff who had not put in place proper systems to monitor, support and supervise inexperienced subordinates. More than this though, the systems themselves were deeply flawed - social services in Haringey were described as shambolic, underfunded and mismanaged - other agencies such as the police and the health service also had serious questions to answer. There were some who insisted this was an aberration. It was implied that Haringey was a known "basket case" and that it would be wrong to draw wider conclusions from this tragedy. Yet while it is true there were circumstances peculiar to some London boroughs, few independent observers are in much doubt that the familiar failings exposed by the inquiry are being repeated on a much wider canvas. If further proof were needed the past year has provided new tragedies and more unanswered questions. The most high profile, the death of Ainlee Walker in the London borough of Newham in January, had disturbing echoes of what happened to Victoria. This two-year-old was also starved and beaten, professionals again failed to visit, and again failed to assess what was going on. So where will all this lead? In some ways the government has already laid the foundations of a new and more ordered social work profession. It has set up a regulatory agency, the General Social Care Council as well as the Social Care Institute for Excellence which is designed to promote higher standards of practice. A new, more wide-ranging, inspectorate is on the way. Most welcome all this, few believe it will be enough. Given that past inquiries have led to new guidance and new arrangements for collaboration it is perhaps inevitable that this time there is a strong demand from some quarters for more fundamental change. Lord Laming has said his report will be a turning point for child protection which suggests he will be radical. But major structural reform will meet opposition. Local government and other agencies are particularly worried about one idea that has been doing the rounds - the creation of a new national body responsible for overseeing child protection. Something akin to the Youth Justice Board has been suggested. It seems unlikely though that ministers will want to create anything that would mean transferring responsibility for child deaths from local officials to national politicians although it is possible to envisage some form of local control being maintained while still separating child protection work from other aspects of social services. But whatever structural changes are made, it is hard to see how similar tragedies can be avoided unless more is done to improve the status, pay, and education of child protection staff. This is difficult work requiring advanced analytical skills - the brutal truth is that social work courses are still struggling to attract the quality of candidates they need. And until all the agencies give child protection a higher priority Victoria's legacy, like Maria's, will be a partial one.